Tench Class Submarine: Laid down, 5 March 1945, at Portsmouth Navy Yard,Portsmouth, N.H. ME; Launched, 12 July 1945; Commissioned USS Remora (SS-487), 3 January 1946. Completed shakedown in Caribbean, the operated out of New London, CT as a training vessel until transiting the Panama Canal and reporting to the Mare Island Naval Shipyard at Vallejo, CA on 14 February 1947 for a GUPPY II modification. Included in the upgrade was Snorkel equipment; an Electronic Support Measures (ESM) package and a "step" sail to improve underwater speed. On 8 June 1950, the San Diego, CA submarine joined the U. S. Seventh Fleet in the western Pacific and was on loan to Task Force 96 to assist in the training of destroyers in anti-submarine tactics when the Korean Conflict began. 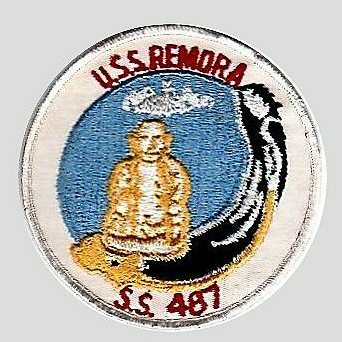 In 1963, Remora was re-assigned to Pearl Harbor, HI and entered the Naval Shipyard there for a 7-month modernization overhaul, this time GUPPY III. Her hull was lengthened by 15 feet and an additional 5 feet added to her conning tower to accommodate ever increasing amounts of ESM equipment. In August, 1969, her home port was shifted to Charleston, SC and it was there, in ceremonies conducted on 29 October 1973, she was decommissioned; struck from the Naval Vessel Register (NVR) and transferred as a cash sale to the Hellenic Republic of Greece. 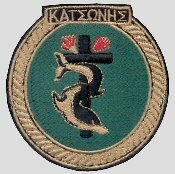 Re-named by the Hellenic Navy to honor Captain Lambos Katsonis who, among other feats, was remembered for the destruction of an Ottoman Empire Fleet by employing "fire ships". Commissioned the same day, HS Katsonis (S-115) and served the Republic for almost another 20 years before decommissioning on 30 March 1993 for the last time. Final fate; Scrapped at Izmir, Aliaga, Turkey. Researched by CTRC Donald J. Wagner, USN (Ret.) for NavSource. Specifications: Displacement, Surfaced: 1,570 t., Submerged: 2,414 t.; Length 311' 8"; Beam 27' 4"; Draft 15' 3"; Speed, Surfaced 20.25 kts, Submerged 8.75 kts; Cruising Range, 11,000 miles surfaced at 10kts; Submerged Endurance, 48 hours at 2kts; Operating Depth, 400 ft; Complement 7 Officers 69 Enlisted; Armament, ten 21" torpedo tubes, six forward, four aft, 24 torpedoes, one 5"/25 deck gun, two 20mm guns, two .30 cal. machine guns; Patrol Endurance 75 days; Propulsion, diesel-electric reduction gear with four Fairbanks-Morse main generator engines, 5,400hp, Fuel Capacity, 113,510 gal., two Elliot Motor Co. main electric motors with 2,740hp, two 126-cell main storage batteries, two propellers. 579k Remora (SS-487) rides the waves down the ways at Portsmouth Navy Yard,Portsmouth, N.H. 12 July 1945. USN photo # 80-G-448567 from National Archives and Records Administration (NARA), College Park, Maryland, courtesy of Sean Hert. 23k Commemorative post mark on the occasion of the Remora's (SS-487) launching at Portsmouth Navy Yard,Portsmouth, N.H. ME, 12 July 1945. Courtesy of petloveshack.com. 174k This photo of the shears of the Remora (SS-487) was taken 7 February 1946. This looks very much like a late wartime boat. A latest model of the "SJ" radar is installed along with a base for a whip antenna mounted on the "SV" mast housing. Mounted on the left of the life ring is a flare pot and to the right is a mounting for a machine gun. note the camoflauge paint applied to the face of the bridge and number one scope housing. USN Archive photo # 19-N-92667. 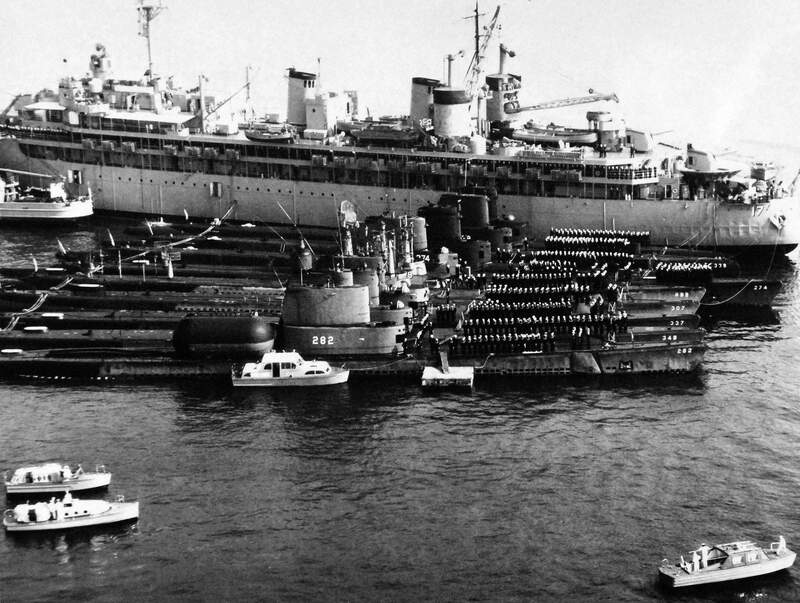 Photo and text courtesy of The Floating Drydock, Fleet Subs of WW II", by Thomas F. Walkowiak. 946k Remora (SS-487) 135 deg stern view off N.B. Portsmouth N.H., 18 February 1946. USN photo # 182-46, courtesy of Scott Koen & ussnewyork.com. 112k Stern view of Remora (SS-487) off Mare Island on 20 October 1947. She was departing for sea trials after her Guppy II conversion at Mare Island which ran from 14 February to 18 November 1947. USN photo # 1918-47, courtesy of Darryl L. Baker. 115k Bow on view of Remora (SS-487) departing Mare Island on 20 October 1947. She was departing for initial sea trials after her Guppy II conversion at Mare Island which ran from 14 February to 18 November 1947. USN photo # 1922-47, courtesy of Darryl L. Baker. 496k Broadside view of Remora (SS-487) off Mare Island on 20 October 1947. USN photo # 1919-10-47, courtesy of Darryl L. Baker. 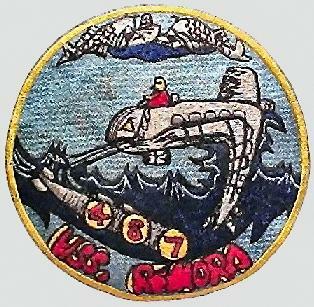 137k Remora (SS-487) moored to the Charr (SS-328), San Diego, CA, 1949, as part of Submarine Squadron 3. Photo courtesy of Ric Hedman, & dedicated to the memory of Master Chief Petty Officer Charles (Monty) M. Montgomery (deceased). Thanks to Chief Petty Officer Joe Phoenix. 47k Capt. Frederick L. Taeusch was the Commanding Officer of the Remora (SS-487) in 1950. Official photograph of the U.S. Navy courtesy of Bill Gonyo. 1.34k This unusual view shows eleven vessels of Submarine Squadron Five (nine submarines, a submarine rescue vessel and a submarine tender) moored side by side for a recent change of command ceremony at San Diego, California. Captain Eugene B. Fluckey, USN, Medal of Honor recipient, relieved Captain Francis B. Scanland, USN, as Commander, Submarine Squadron Five on 1 August 1955. 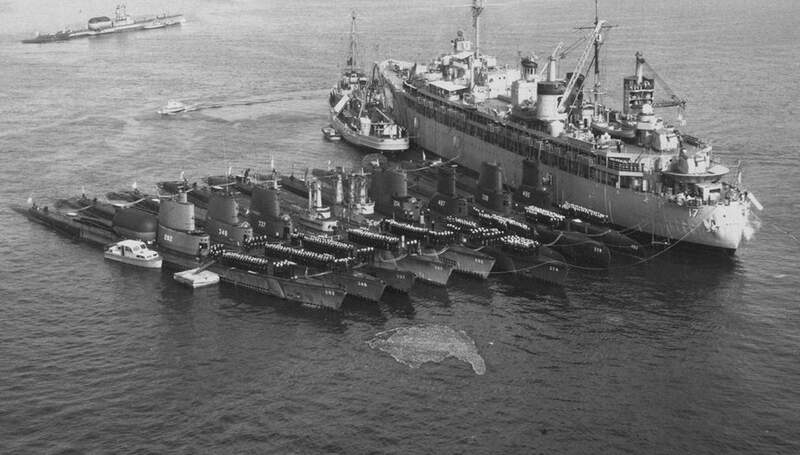 Nested alongside the submarine tender Nereus (AS-17) are: Tunny (SSG-282), Cusk (SS-348), Carbonero (SS-337), Tilefish (SS-307), Spinax (SSR-489), Rock (SSR-274), Remora (SS-487), Catfish (SS-339), and Volador (SS-490), and the submarine rescue vessel, Florikan (ASR-9). Photograph released 3 August 1955. Photo # USN 681919 courtesy of the National Museum of the U.S. Navy, via flickr.com. 198k Remora (SS-487) highline transfer to Charr (SS-328). Photo courtesy of Scott Koen & ussnewyork.com. 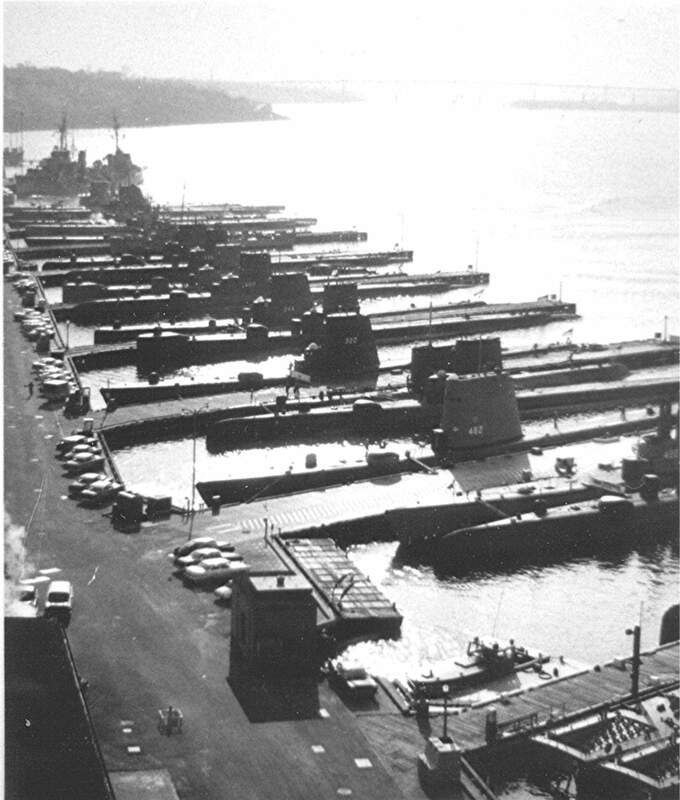 226k Busy piers at lower base in Groton shows a few SSKs, 1957. & Sea Robin (SS-407), & Piper (SS-409). The rest of the subs are too far away for positive identification. Text courtesy of Dave Johnston (USNR). Photo i.d. courtesy of Mike Brood. USN photo courtesy of Submarine Force Library, courtesy of Ken Hart. 1.17k Starboard side view of the Remora (SS-487) prior to her Guppy III conversion in 1962. Photo from the Vallejo Naval and Historical Museum via Darryl L. Baker. Photo courtesy of Robert Hurst. 109k Remora (SS-487) leaving Pearl Harbor after a 7 month GUPPY III conversion which lengthened her hull by 15 feet and her conning tower by 5 feet, circa 1962. Text courtesy of DANFS. 1.9k Cusk (SSG-348) and Remora (SS-487) in 1963. What might be an SSK (Bashaw (SSK-241), Bluegill (SSK-242) or Bream (SSK-243)) is bringing up the rear. Photo i.d. courtesy of John Hummel, USN (Retired). 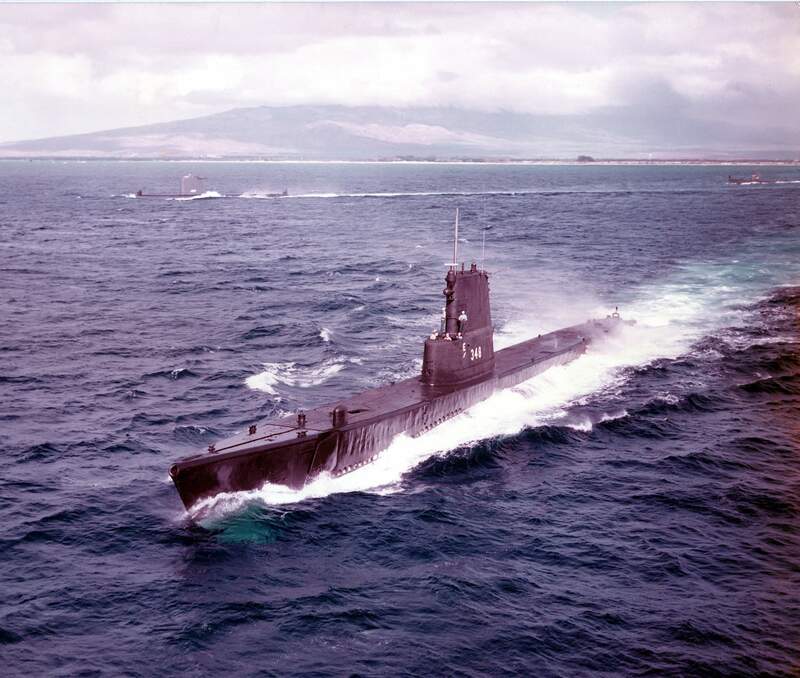 530k Circa 1960's photo of the Remora (SS-487) on the low seas. Photo courtesy of Scott Koen & ussnewyork.com. 532k Tai Sing Loo Jr meets Remora (SS-487) at Pearl Harbor. USN photo # 182-46, courtesy of Scott Koen & ussnewyork.com. 311k Remora (SS-487) approaching dock with tug assistance, at Vancouver BC on 25 June 1965. Walter E. Frost Photographer, Source: City of Vancouver Archives, Photo No. AM1506-S3-3-: CVA 447-7746 courtey of Mike Green. 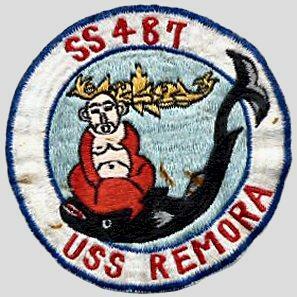 405k Five page circa late 1960's Welcome Aboard the Remora (SS-487) PDF. PDF courtesy of Scott Koen & ussnewyork.com. 163k Bow on view of a West Coast Remora (SS-487) alongside a destroyer. Photo courtesy of John Hummel, USN (Retired). 119k Remora (SS-487) following her commissioning into the Greek Navy as Katsonis (S-115), circa 1974. Official Hellenic Navy picture, courtesy of Tony Vrailas. 164k Katsonis (S-115) in pierside receiving some T.L.C. Photo courtesy of militaryphotos.net. via photoship.co.uk & C�neyt Demir. 155k Katsonis (S-115) at the ships disassembly zone, Izmir, Aliaga, Turkey. Aliaga contains a shipbreaking yard, so I assume Katsonis was sold to a third party which sent it there. I'm surprised that it was not sunk in an exercise. Perhaps it was not HN's practice at that time. Text & photo courtesy of militaryphotos.net. via C�neyt Demir.